There’s a bakery in town called The Bread Shop where they serve one of the best lemon tarts I have ever had. Something else they also have on the menu is healthy and light lunch options! 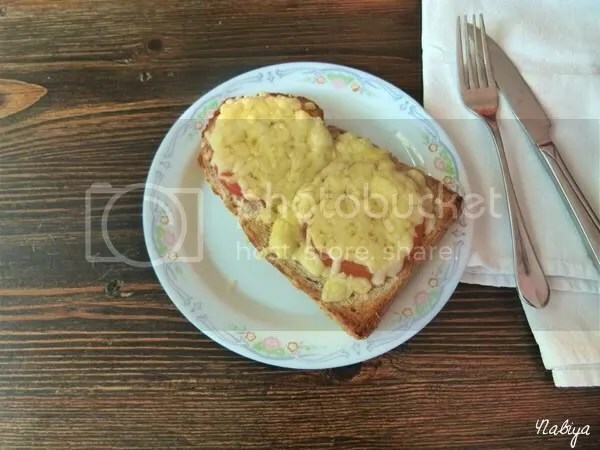 We went there for a quick lunch yesterday, and I ordered this amazing tomato and cheese on toast that they have. It was so good, and such a filling lunch, too, that I got cravings for it when I woke up today. It’s a good thing I also bought a load of their “broom bread”, which is basically super high fibre bread, to attempt to recreate the lunch I had yesterday! Easy enough, though probably not as aesthetically pleasant as theirs was… I realize now that I should have probably used room temperature sliced cheese, as opposed to pre-grated cheese straight from the fridge. Anyway, give it a shot, it’s good for breakfast, lunch, or even a snack. Preheat the oven to 200C, assemble the ingredients for the open faced sandwich on a baking sheet, bake for 7-9 minutes. Serve warm.